The Indian Retail Chain sector is at an all-time high right now. With foreign investment in retail, competition has been cut throat as the big shops fight amongst each other and e-commerc e upstarts for the business of the middle class consumer. The primary reason why retailers hugged Social Media from the get go owes largely to the fact that it serves as a direct one-to-one connection with the consumer. This is a great platform for any retailer to study their consumer, decoding their likes/dislikes, understanding what offers work best as well as increase sales. Social Media also has a huge potential for in-store operations for retail chains because if social networks like Twitter are used, it can be an effective customer service platform. A mix of several factors, such as: community size, activity level on social media, prominence amongst the consumer base, media mentions etc. were the reason why the above brands were chosen. Shoppers Stop (4.6M), Lifestyle International (3.6M), Titan Watches (1.4M), bag the top 3 spots on the chart and are also the only brands to cross the 1 million mark. While Shoppers Stop has the most number of fans, FBB has the highest fan growth at 28.94%. This is a remarkable growth rate considering other brands are able to achieve only a 10% growth rate. The growth rate of most other brands is low, around 5% or less, so catching up with Shoppers Stop and Lifestyle will not be easy, if it can be done at all. One way these brands can see higher growth is to craft some campaigns that get people liking and sharing amazing content with their friends. Although contests is one way this can happen, building a community of Facebook fans who like a page just because it once gave away iPads isn’t the best way to create a vibrant community. An interesting take away from the chart is that three electronic brands Croma, Vijay Sales and Reliance Digital are losing the race with extremely low number of fans and growth rate. Reliance Digital seems to be trying hard with a 10.42% fan growth, the third highest in the sector. However, this rate is still low when we compare it to other sectors. On Twitter, the sector still lags behind in terms of the number of followers as well as growth rate. Shoppers Stop again leads with 7K+ followers and a growth rate of 13.52%. These numbers are due to an effective use of the micro-blogging site as an engagement platform. However, it is shocking to notice that none of these brands cross even 10K followers. When NDTV and IPL Twitter handles boast of 1m+ followers, it can’t be argued that there aren’t enough Indian users on Twitter! Croma has the highest fan growth at 5%, which actually amounts to a very small number of actual new followers since the total follower count is just shy of 4,000. I was surprised to see the Marks & Spencers India handle losing followers, this would be of a huge concern to me if I was incharge of the account! Overall I would say that the size of the retail community on social media is next to nothing, considering the huge popularity of these retail chains. It is quite clear that they need to up their game to achieve concrete goals on social networking sites. Fashion at Big Bazaar has the most number of people engaging on the brand page as compared to others. This was expected as the brand executed an interesting campaign named Guess and Win, promoting FBB apparels. Even their daily posts are appealing, offering advice on fashion and accessories and do away with the monotonous product posts. The tone of the content is friendly and topical which works because your brand needs to find the right voice which isn’t too corporate or sanitized of any personality. On the other hand, Titan Watches India has made the least number of posts. To be precise, just three posts in one month. While most brands made an effort of being regular with 2 posts a day, other brands like Landmark and Vijay Sales could be said to be guilty of virtually ignoring their fan base. Reasons for failure could be repetitive content, no content strategy at all, irregular hours of posting and lack of innovation. Most of the brands have adopted the push strategy and promote product-centric posts. There are three brands which do stand out when it comes to creating an engaging personality. The first is Big Bazaar, which I mentioned earlier. The other two are Croma and Marks and Spencer. They feel like they are having fun with their content and it’s not being restricted to just pushing out brand related content. The chart below demonstrates which brands are prolific on Facebook by posting plenty of updates. Most of them are around the 60 posts mark which means they are doing around 2 updates per day – which is needed as people are checking their Facebook at different times. On Twitter, many of these brands are not doing a great job either. 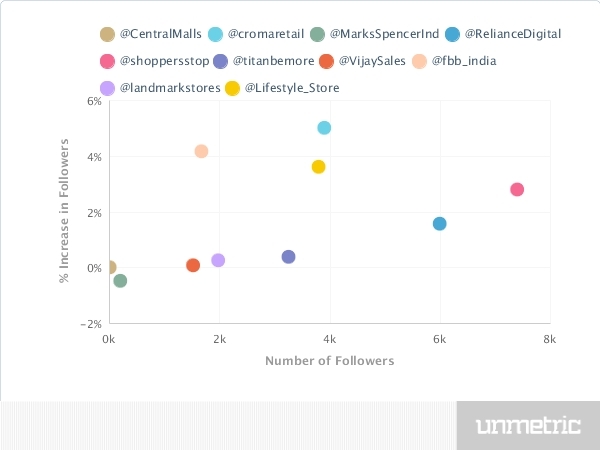 Though Shoppers Stop has the most number of followers, with Reliance Digital and Croma second and third, the content is hardly exciting. Interestingly, the content on Youtube is innovative as I browse through Shoppers Stop brand channel. Shoppers Stop has relevant content which is updated twice a month, offering tips on looks, fashion and accessories rather than the usual fare of TVCs. This is a refreshing break from advertisements stuffed into Youtube channels which too many brands do. The retail chains have an almost negligible engagement score and these unimpressive reports showcase dead brand pages that are alive on social platforms. 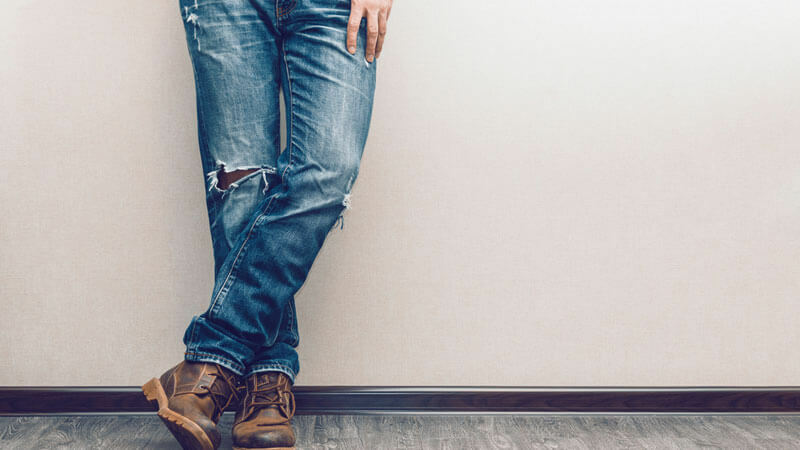 A couple of interesting posts is all it takes to bring up your score but unfortunately, the brands do not look upon engaging with their customers as an important task. The Engagement Score, which takes in to account the number of Likes, Comments, Shares, estimated impressions as well as number of fans can be used to judge engagement across brands, regardless of how many fans each page has. 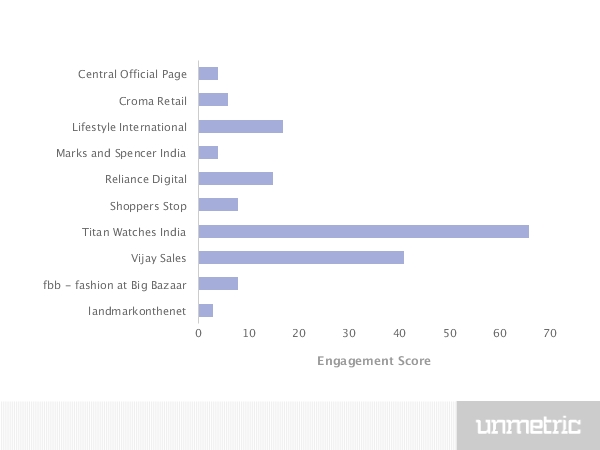 The Engagement Score for the sector is 34, in the chart below you can see that only two brands managed to score above the sector average. Another way of looking at engagement is to see how many interactions each post got. 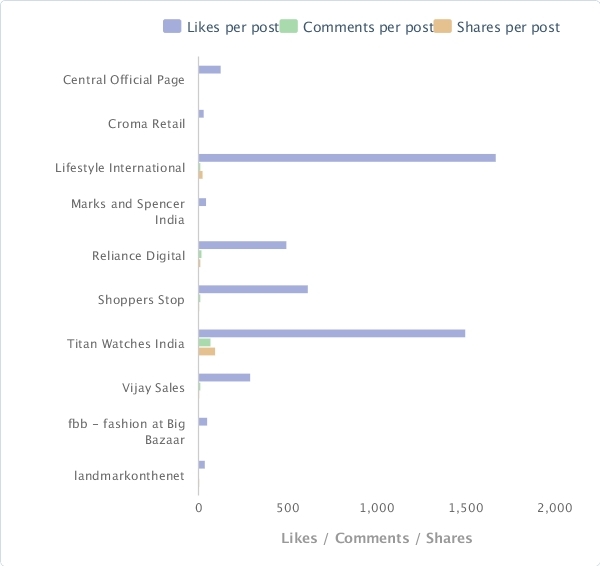 The chart below shows the average number of Likes, Comments and Shares each post got for the various brands. Note: There is isn’t currently anyway to say if brands like Lifestyle International got more likes if they promoted the post. 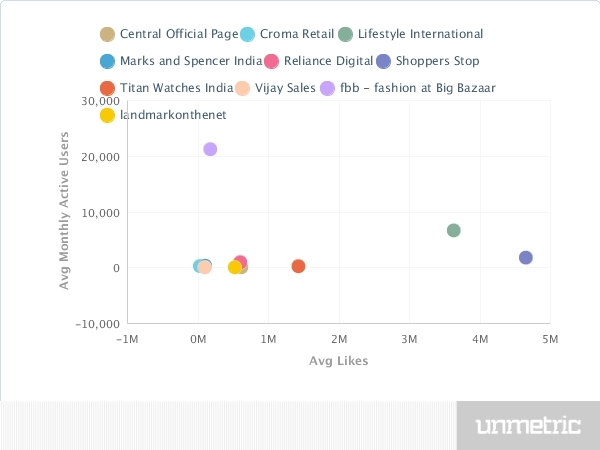 However given that Lifestyle and Titan Watches are the second and the third most liked retail pages, if these brands are promoting their posts, it looks like it’s helping them grow their fanbase. Lifestyle has engaged with its fan base the most but failed to generate enough comments/shares since there is no interaction by the brand nor does it support customer posting on the wall. Having over 3 million fans, a post on an average receives only 2,000 likes. Titan India Watches posted only 3 updates in a period of 1 month, yet the posts are still better engaging posts among the other brands. This leaves me with the question; does a brand believe that boosting a post is enough and no content strategy needs to be followed? 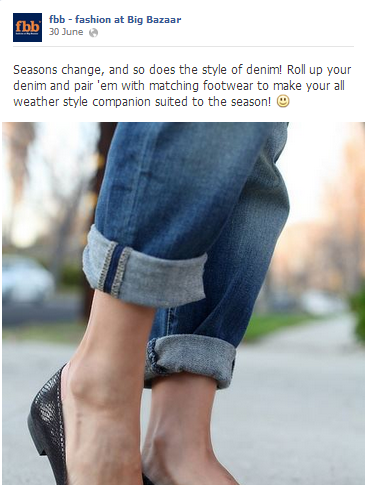 And after boosting a post when the comments pour in, do brands not feel the need to interact with this user base? Since Titan has not made a single comment, it makes me believe so. On Twitter, a set pattern of promoting products, playing quizzes and sticking to template lines for customer service is being followed. However I noticed that Vijay Sales has lately improved its Twitter engagement levels. They are identifying problems users could have and trying to get into conversations relevant to the brand. The brand is using Twitter to connect other brands to sort customer queries too which is not something I have seen before on Twitter and is huge innovation by Vijay Sales. Apps are often something that are created as a secondary function of a campaign, often with nothing more than a splash screen or requesting fans like something to be entered to win. Therefore, it is not surprising to see most of these retail brands have next to no usage on their Facebook apps. 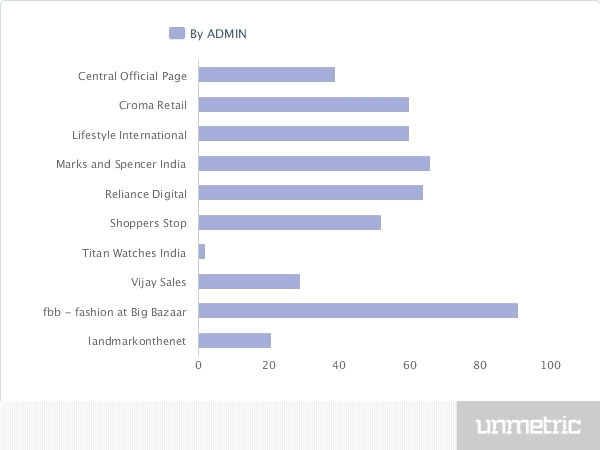 The exception here is Fashion at Big Bazaar, which had 21K+ monthly active users and a total of 10 applications. Their application Guess and Win received a great response for obvious reasons of being a very innovative approach. At 11%, FBB saw 10 times better usage than the sector benchmark of average monthly users. On Twitter, most brands are able to reply to 40% to 50% of customer queries in less than 15 minutes. 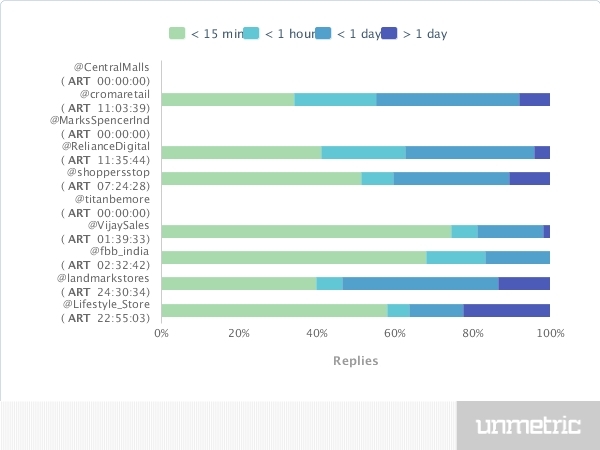 While Vijay Sales replies the fastest among all brands, with an average reply time of 1 hour 40 minutes, Landmark Stores take over 24 hours to reply. This is a very important metric since a brand’s reputation has started depending on how quick they respond on the micro-blogging site. 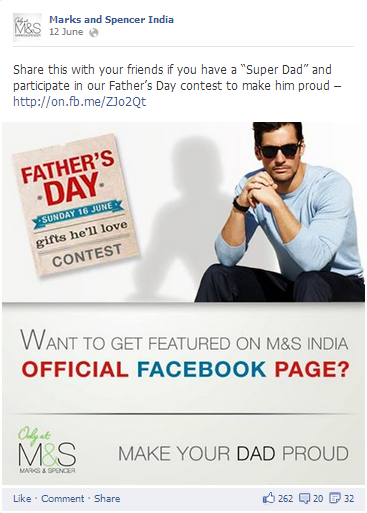 On Facebook, Shoppers Stop takes an average time of 3 hours to reply to users posting on its wall. I expected more from FBB given their relatively fast customer service on Twitter but the brand hardly replies to users on Facebook and when it does, the reply time is very long. This could be a result of the agency taking care of customer service issues on its Facebook page and the agency needs to get approvals for replies. I noticed another trend with Vijay Sales which replies to Facebook comments only to flash product prices and doesn’t seemy bothered to get involved with any meaningful conversation. Brands need to understand that likes alone do not ensure visibility and reach. The sentiment, which is reported after analyzing the fan posts on the pages reflect a positive and neutral reaction. 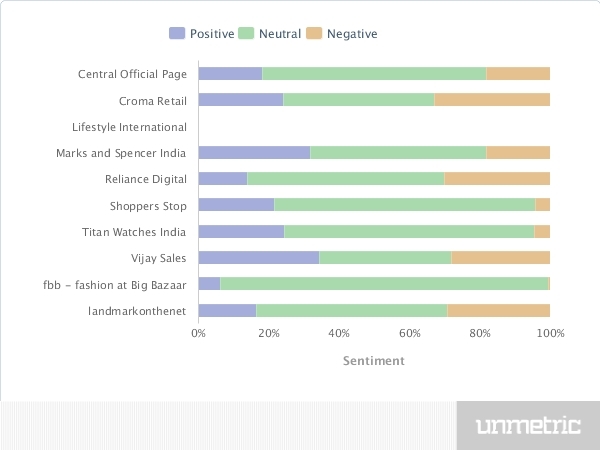 The chart below indicates that Titan Watches India and Shoppers Stop have the most number of happy fans on Facebook. Lifestyle does not display any sentiment since the wall is not open for fan posting. 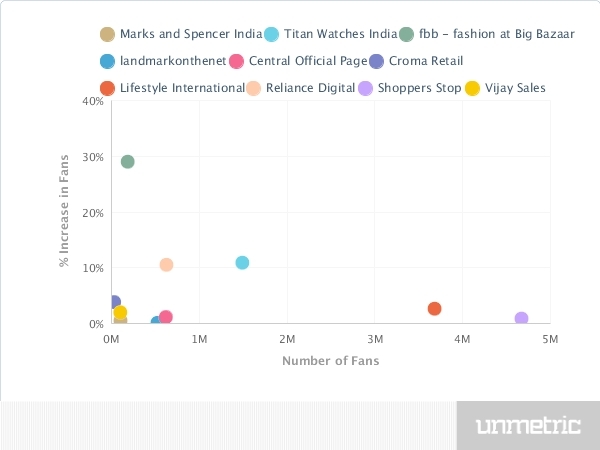 On the other hand, nearly 40% of fan posts are positive in nature for both Marks and Spencer and Vijay Sales. On Twitter, the sentiment is fairly positive too. The brands are making an effort to reply and have an interaction with the community. 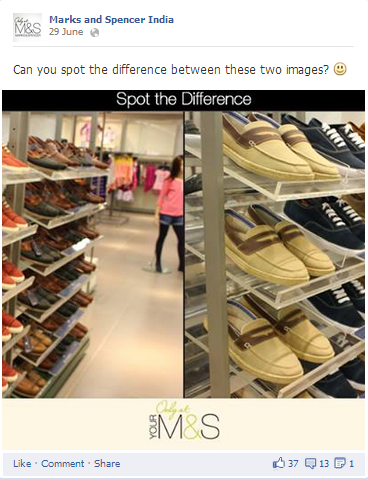 Retail Chains are definitely not putting in 100% for their social media marketing. Some are trying to up their game but most campaigns are falling flat, customer service on both social networks leaves a lot to be desired and content strategies seem unimaginative. While these brands may have been early adopters on social media in India, other sectors like FMCG and telecoms are racing ahead with innovative campaigns, engaging content and fast, useful customer service. Interaction and engagement seems to be missing completely whereas these are the most important factors in creating a mark in the digital world. Fashion at Big Bazaar should be looked upon as a good example on Facebook while Vijay Sales is a clear winner on Twitter.